A book of dreams and cautions that reaches out to the reader time and again with humor, quiet wonder, wit, joy, and companionship. Depending on dialect, the Anishinaabemowin word "weweni" expresses thanks, exactitude, ease, and sincerity. In addition, the word for "relatives" is "nindenwemaaganag": those whose "enewewe," or voices, sound familiar. In Weweni, poet Margaret Noodin brings all of these meanings to bear in a unique bilingual collection. Noodin’s warm and perceptive poems were written first in the Modern Anishinaabemowin double-vowel orthography and appear translated on facing pages in English. From planetary tracking to political contrasts, stories of ghosts, and messages of trees, the poems in Weweni use many images to speak to the interconnectedness of relationships, moments of difficulty and joy, and dreams and cautions for the future. 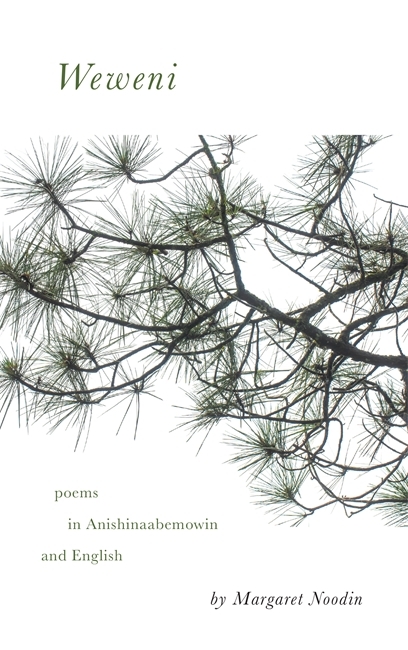 As poems move from Anishinaabemowin to English, the challenge of translation offers multiple levels of meaning—English meanings found in Anishinaabe words long as rivers and knotted like nets, English approximations that bend the dominant language in new directions, and sets of signs and ideas unable to move from one language to another. In addition to the individual dialogues played out beween Noodin’s poems, the collection as a whole demonstrates a fruitful and respectful dialogue between languages and cultures. Noodin’s poems will be proof to students and speakers of Anishinaabemowin that the language can be a vital space for modern expression and, for those new to the language, a lyric invitation to further exploration. Anyone interested in poetry or linguistics will enjoy this one-of-a-kind volume. Margaret Noodin is assistant professor in English and American Indian studies at the University of Wisconsin–Milwaukee. She is author of Bawaajimo: A Dialect of Dreams in Anishinaabe Language and Literature. She is also one of the founders of the group Miiskwaasining Nagamojig and ojibwe.net. Noodin’s poetry are the gifts life can be built on. They truly illustrate weweni, deep care and consideration, for all of who we have been, are, and will be as Anishinaabeg. These words—invested with a fierce love and commitment to our language and community—are a revolution. Miigwech, Margaret. A book of dreams and cautions that reaches out to the reader time and again with humor, quiet wonder, wit, joy, and companionship. Simply lovely. A skilled artist’s work shows here, creating awareness with the touch of word and sound, resonating syllable by syllable with love of language, known to all of us who have imagined each part of the world, holding some immanent potential for poetic expression. Read aloud or silently, [. . .] this book [. . .] is excellent in the most good and proper Anishinaabe ways. Recently, poetry has fallen victim to a slew of misconceptions and stereotypes. Many still avoid it, believing it to be written in a way that purposely confuses the reader, while others are worried of finding the same repetition of themes and images. Noodin's "Weweni" puts to ease both these worries in a stunning collection that not only presents an original set of poems but, more significantly, acts as a learning experience for the reader by introducing the complex and sadly overlooked culture of the Anishinaabe people.